We are currently publicising this training direct to club officials, through the SACC and SMMC Websites, on social media and will shortly be writing to all registered marshals. However the most effective way of recruiting marshals to attend these events is through the local clubs. It is, therefore, disappointing that the first two events of the year are looks very thin on numbers. For these events to be viable we need to have at least 15-20 delegates, both to achieve a good training environment, and to enable us to continue to secure the valuable time of our volunteer instructors. As I am sure you will be aware, like other events, some of our expenditure starts to be incurred in advance of the event itself. We do ask people to pre-register and this helps us to ensure the correct amount of training materials are provided, as well as helping us ensure good value for money from the Association’s (your!) funds. As a result we will be reviewing the number of registered delegates two weeks before each event to decide whether they are viable. The last thing I want to do is to start cancelling training events. With the pressure on marshal numbers and the need to ensure our marshals are operating at (trained to) the highest standards this would be a real own-goal for Scottish Motorsport. So whilst hoping you had a good festive season could I please ask you all to ensure that your club promotes the training opportunities in your area/disciplines as one of your New Year resolutions? Further to our previous invitation, it is my pleasure to announce that Supplementary Regulations are now live and entries now open, for the 2017 Aquarius Navigational Rally and Aquarius Clubman Navigational Rally on the night of 4/5 February 2017, to which your members are warmly invited. The rally will feature approx 118 miles – of which ~75% shall be competitive motoring – of the best lanes in Fife & Lowland Perthshire, starting and finishing in Kinross. This year we continue to build on our well-received format of recent years of a “no nonsense” fully pre-plot “tulips and map refs” navigational format, with an all-tarmac route which enables standard unmodified road cars to compete. Improvements for this year include an even more compact route – all within a 13 mile radius of Kinross, inc. centralised start, refuel and finish locations, all within easy reach of the M90 motorway in Central Scotland – and timing schedule – with the first car due away at 21.21 and back at the finish at 02.01. Through this, we aim to encourage those new to night events or to the area, whilst still providing experienced crews with a rewarding night’s sport (& a well-earned breakfast!). All for an entry fee of £75. This year we shall again be the opening round of the 2017 SACC Navigational Rally Championship, and a round of the 2017 HRCR Premier Rally Championship. In addition to the National B event, we will again also be offering a supporting Clubman event, giving those without an MSA competition licence a chance to be part of the action. Several club members were out in the wilds of Dumfries and Galloway over the weekend assisting with the 2016 Scottish Borders Hill Rally. 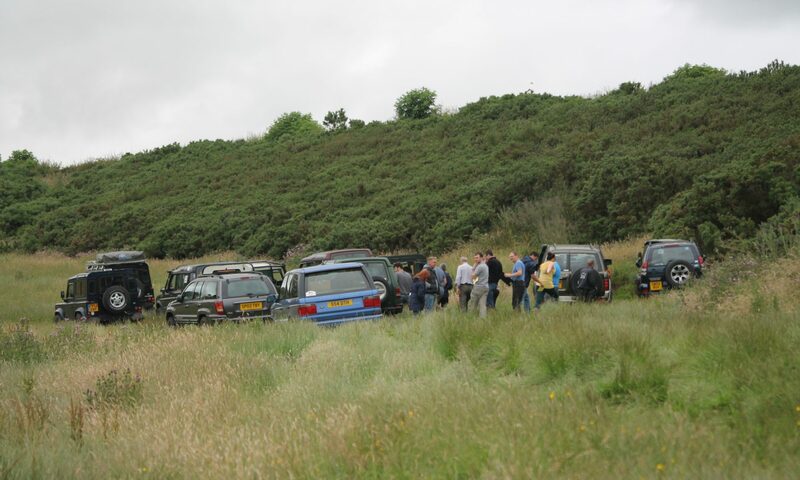 Held in Forrest Estate, this event covered over 100 miles in two days, including two night stages. At first glance it looks like a forest stage rally, but with very strange looking vehicles – everything from very a standard Shogun Pinin and a Suzuki Jimny through to custom built vehicles with V8 engines upwards of 5 litres. Bowler were well represented with the Defender Challenge vehicles along with the new Bowler Bulldogs – absolute monsters. Once the stage starts the similarity to a normal forest rally disappears. At every opportunity the route disappears into quarries, gravel pits, forest tracks, anything to make it tricky. If you haven’t been to an event like this before make sure you get to next year’s! SSCC members were spotted running the central main time controls, assisting with stage commanding, marshalling and even wandering around spectating under the guise of being club stewards. A great time was had – the weather was even kind on Sunday. Congratulations to the organisers for a well run event, and to all the competitors – most even got to the finish. The latest SACC newsletter is here. Many thanks to David Law as ever for his work! On Saturday the 22nd of October, Aberdeen and District Motor Club, will be running the Weston Transport / Branston Granite Rally at Leuchars Base in Fife. 8 stages, 40 miles, with the 1st car starting at 09:00. This is a brand new rally, and will be a round of the Brick and Steel Junior 1000 Ecosse Challenge 2016, along with competitors from the Scottish Tarmack Rally Championship. The event also hopes to be a new round of the Scottish Tarmack Rally Championship 2017, so you support to make this event a success, would be very much appreciated. If you would like to Marshal, please can you get in touch with Ewan Stanhope the Chief Marshal, as soon as possible. JIM CLARK RALLY, WE WANT OUR CLOSED ROAD RALLY BACK. We would like the Lord Advocate to bring his inquiry regarding the fatalities on the 2014 event to a conclusion. The Jim Clark Rally generates approximately £3.5 million for the Scottish Borders economy each year and has substantial support from Scottish Borders Council, politicians and the general public. Following the fatal accident in 2014 the JCR has been unable to run on closed public roads due to an inquiry being carried out by the Lord Advocate of Scotland. It is in the public interest that the rally return to running on closed public roads in 2017. Two years with no conclusion has made it difficult to guarantee the future of one of the UK’s biggest sporting events. Here is the latest SACC Newsletter and available on the link below, please share around anyone who may be interested! The May edition of MSA Extra is out now – just follow the link. The latest SACC Newsletter is now out. As ever, many thanks to David Law for pulling this together.